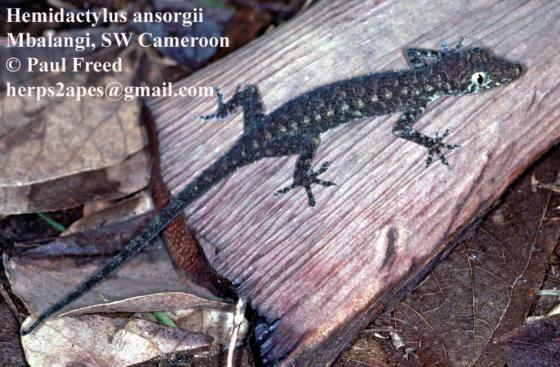 Can you confirm these amateur observations of Hemidactylus ansorgii? Type locality: Sapele Station, Niger Delta. Comment Perret (1975) and Kluge (1993) considered H. ansorgii as a junior synonym of H. intestinalis Werner, 1897 but Henle and Böhme (2003) have presented compelling evidence that the latter is, in reality, a junior synonym of H. muriceus. Perret (1975) in turn regarded H. muriceus as a senior synonym of H. longicephalus. Type: not in BMNH (P. Campbell, pers. comm., 7 July 2014). Etymology Named after Dr. W.J. Ansorge, who “presented [a single specimen] to the British Museum”, i.e. probably the collector of the type specimen. Kluge A G 1993. Gekkonoid Lizard Taxonomy. International Gecko Society, San Diego, 245 pp.